English and German will be translated by myself while developing. All other translations done by users out of the community. When I release a new version it can occur that some new sentences are not translated. 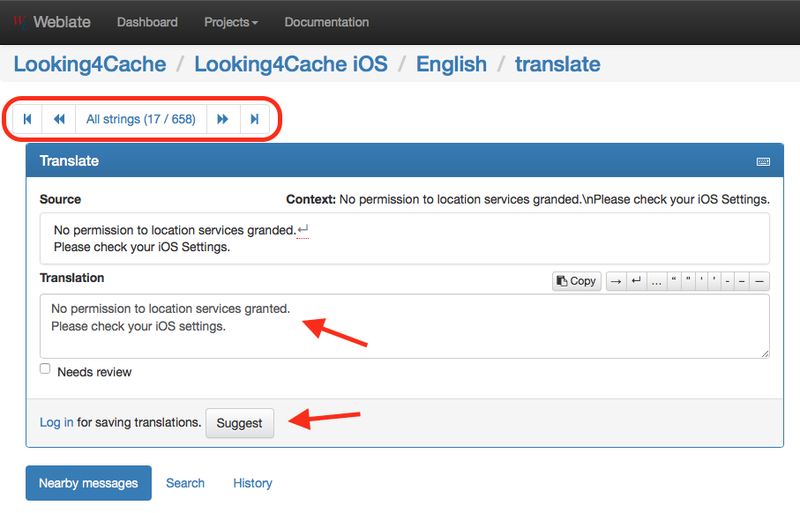 Looking4Cache also in your language? The english translation may have some errors and wrong grammar. My first language is German, so I would be excited if you help me by correcting my mistakes. All translations can be viewed and edited on translate.looking4cache.com. On the overview page of a language you can search for a specific text or you can iterate through all texts using the link ‘All strings’. 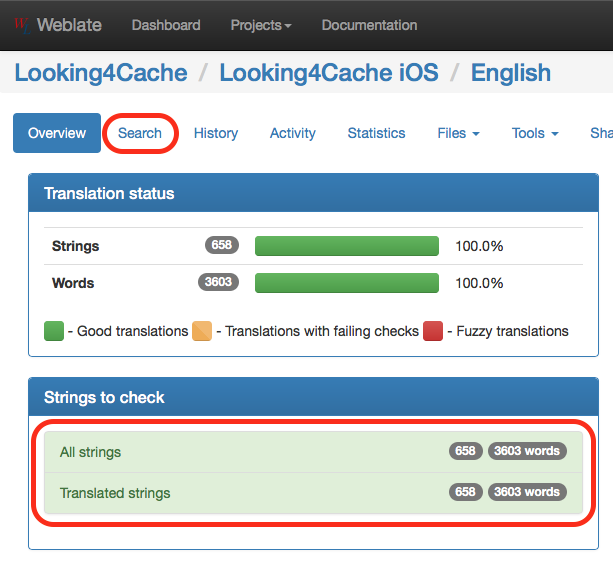 As you performed a search or clicked on ‘All strings’ the first translation appears. With the navigation on the top you can click through the translations. Change a text by editing it in the field ‘Translation’ and press on ‘Suggest’. This saves the change so I can accept it. I’m a user of your application in iOS and I’ll be glad to help you with the translations to Spanish if you want (starting from English because I don’t speak German). If you need help with this task, don’t hesitate to contact with me. Please go in the config and open yor user. Use the button “Remove Auth.” and after this you can authorize again. Can you permit it ? or explain me how to do it ?